Montessori Children’s House was established 1987. We provide a preschool educational experience for children between the ages of 15 months and six years. Debbie Ashley became owner operator of the school in 2007. Montessori Children’s House is an independent private school that is licensed with the Ministry of Education under the Day Nurseries Act. We also have a contract with DSSAB for Subsidized families needing childcare. We also receive Quality Assurance by the DSSAB District of Nipissing Social Services Administration Board. We are located in 73 Gertrude St. E. North Bay, ON. Our main objective is to provide a carefully planned, stimulating environment which will help children develop within themselves the foundational habits, attitudes, skills and ideas which are essential for a lifetime of creative thinking and learning. To build habits of concentration for lifelong study skills. To help develop each child’s innate, ultimate potential through high self expectations. 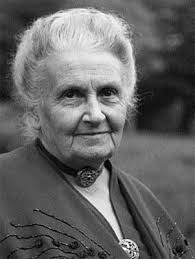 Maria Montessori was the founder of the Montessori Method of Education. She was the first woman permitted to become a Doctor of Medicine in Italy over 100 years ago. Maria developed the first Children’s House before the 1st World War in the slums of Italy. She worked with the children who were left alone while parents worked.Maria worked with these children indirectly first by teaching them how to care for one self, mending clothes, preparing foods, plant gardens, clean the house… all the basic skills these children did not know and in turn, they taught their parents. Before long, reading, writing and math took place. The children were so excited they did not want to return to their own homes. Montessori has evolved over the years to become the most popular form of education worldwide. Children love coming to Montessori Preschool not only to learn to read, write, add and subtract but they do so on their terms and level of personal development. They play while they learn and most children would be happy having sleepovers at preschool. This speaks volume in the eyes and hearts of parents who worry about their children’s interests and needs being met in traditional school setting.